Plexiglass also called acrylic or acrylic PMMA, which has high transparency, common price, the advantages of easy to be CNC machined, so the Plexiglass parts are often widely used in our daily life now. 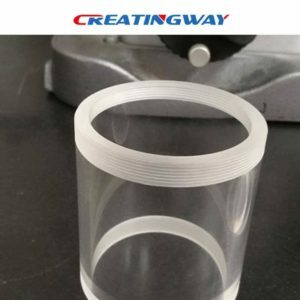 Specifically, the PMMA material is used in industries like optic instrument, stationery, outover for solar energy, car, motocycle etc industries. Medical: Baby incubator, various kinds of surgical medical instruments: sanitary ware, handicrafts, cosmetics, stents,aquarium, etc. Industry: Instruments surface plate and cover, etc. In common, we choose use oriented film to packaging this parts when finishing, but this packaging has a certain petrol fumes, so we need to confirm this functions and application of the parts in advance. Such as: For food grade parts, it is not acceptable for smell petrol fumes so we need to customized the packaging. Is the Plexiglass part easy brittle? Maybe almost of people said “No, it is impossible”. But in what circumstances is plexiglass part fragile, whether you have considered the similar questions or not. It is easy brittle when the plexiglass parts are stained with oils or similar one, so we need to focus on the whole production, packaging and transportation details of the parts to avoid it. Creatingway as one professional &comprehensive CNC Machining manufactuer. We can machining different materials of metal parts and plastic parts. We have own advanced machines equipment and First-class technical personnel to meet your any requirements.